Serving Southeastern Michigan since 2003. We are dedicated to provide the highest level of professional service to our customers. We are bonded, insured and licensed air duct cleaners and dryer exhaust technicians. You should have your Heating and Air Conditioning Air Ducts cleaned every 3 to 5 years, depending on your home's environment? Do you have pets or active children? Does someone have allergies or respiratory problems? Air Duct Cleaning is done to help you have a more liveable home environment. Helping to improve Indoor Air Quality through Air Duct Cleaning and proper air filtration is our business. We invite you to search through our site and call or e-mail us with any questions you may have. 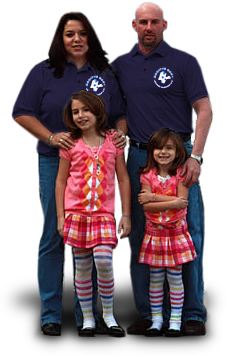 We are a family owned and operated business based in Southeast Michigan. Servicing the downriver area since 1994 in powerwashing we have now expanded our services to Air Duct Cleaning . We take pride in helping you protect your family and your home. We might take a little longer, but it pays in the end. Customers get to view our work progress from start to finish utilizing a scope or TV monitor. Video inspection is done before and throughout the cleaning process. This process takes the guessing out of how clean your ducts are and shows you where your hard earn money is going. Ken is an allergy sufferer and knows how important this is to have done right. We always go the extra step to ensure we not only meet, but exceed our customer's expectations. We exclusively use Meyer gas powered vacuums, which are the best cleaning methods available.